This entry was posted in Club Service, Community Service, Just for Fun! on December 22, 2011 by Rae. This entry was posted in Community Service on December 14, 2011 by Rae. 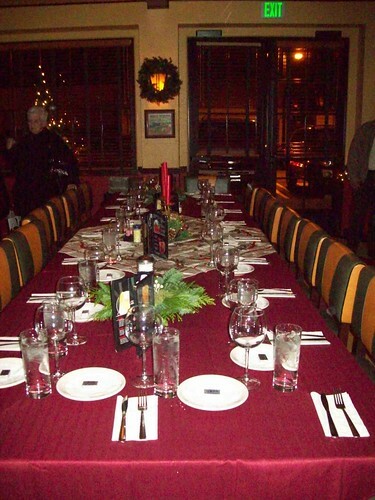 Orange Sunrise Rotarians, their partners and guests gathered at Ruby’s Old Towne Diner at the historic Santa Fe train station for a great dinner and fun gift exchange. Members first attended the City of Orange Tree Lighting Ceremony in nearby Orange Plaza, where thousands of local residents listened to a choir lead by Dr. Michael Short and sample tasty treats from a variety of booths in the Plaza. Rotary Exchange Student Julia Molto (sponsored by Orange Sunrise Rotary) attended the festivities and dinner, where she presented President Howard Glasser with the banner of her hometown Rotary District and local Rotary club. This entry was posted in Club Service, Just for Fun! on December 11, 2011 by Rae. 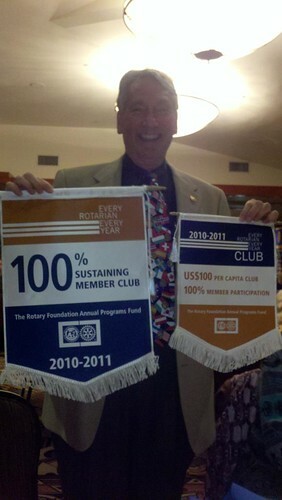 Orange Sunrise Rotary was proud to contribute 9 quilts to the more than 500 collected at the Institute! The quilts will go to the babies receiving corrective plastic surgery through the Rotaplast project. Photo: Phyllis Giersch, Diana Barden, Gail Serno, and Valerie Edwards. All of the quilts that were collected at our Rotary Zone Institute in Palm Springs are now safely in the hands of Gail and Valerie! This entry was posted in Community Service, International Service, Youth Service on December 9, 2011 by Rae. 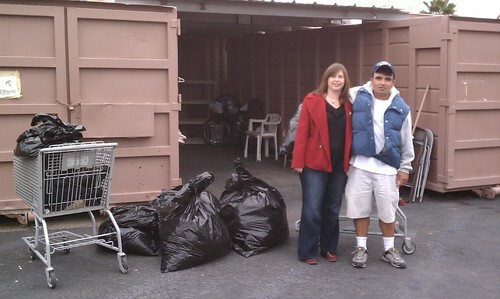 Today Melissa and I dropped off the Orange Sunrise Rotary’s winter clothes donation for Mary’s Kitchen in Orange. The club was able to collect 11 stuffed bags of winter cloths for the homeless in a very short time with the help of club members, Family and friends. Its amazing that taking the time to pull just a few things out of your closet can mean so much to the others. This entry was posted in Community Service on November 19, 2011 by Rae. Orange Sunrise Rotary provided three families in Orange with the fixings for a fine Thanksgiving holiday. 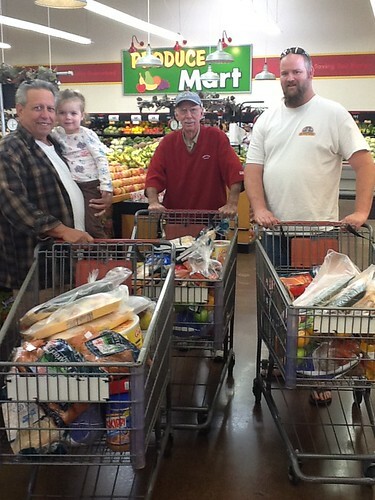 Rotarians shopped for the families, selected on the basis of need by the YMCA of Orange. After assembling the goodies into “baskets”, the Orange Sunrise team personally delivered the holiday surprises to the families. Orange Sunrise Rotary members collected 3 large file boxes of goodies for our troops in Afghanistan, including one large box of hygiene supplies (desperately needed toothpaste, razors, etc.) a big box of candy, playing cards, books and games, and bonus box of Hot Rod magazines. 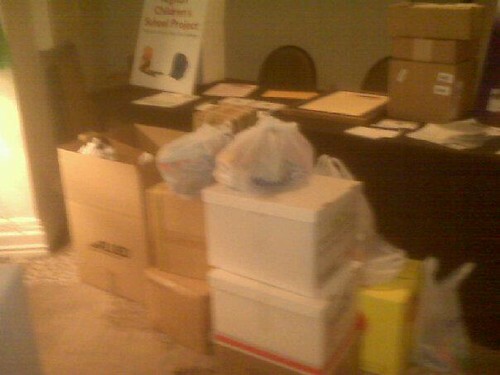 The items were part of a drive organized in connection with the Rotary Zone Institute, held in Palm Springs, November 10-12. Member Rae Shirer delivered the goodies, which were picked up by Camp Pendleton Marines for shipment overseas. This entry was posted in Community Service, Vocational Service on November 15, 2011 by Rae. Orange Sunrise Rotarians turned out with family and friends to attend the annual Rotary District 5320 Foundation Dinner, honoring clubs and Rotarians for their support of the Rotary Foundation. The club was acknowledged for achieving three giving goals in the 2010-11 Rotary year: Every Rotarian Every Year (for each and every club member giving some amount to the Foundation); Sustaining Member (every member giving at least $100 during the Rotary year); and the Gates Challenge award for the club’s donation of $2000 during the Rotary year to End Polio Now. In addition, Honorary Member Grant Engle was honored for his work as the Centennial District Governor and kicking off the effort for Rotary 5320 to become a 100% Paul Harris Fellow District. The District achieved this goal in 2011, and is only the second District in the world to do so. This entry was posted in End Polio Now, The Rotary Foundation on November 12, 2011 by Rae. El Modena Interact Club is Going Strong! 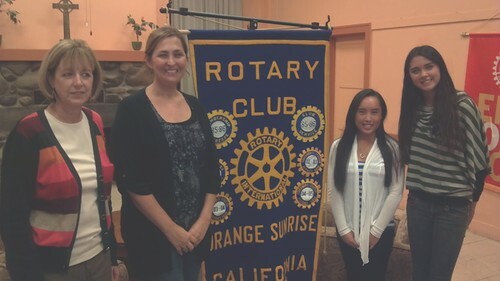 Members of the Interact Club of El Modena High School (sponsored by Orange Sunrise Rotary) visited OSR on November 9th to update Rotarians on their planned activities and to plan joint projects with Rotarians. These young leaders are the future of Rotary! This entry was posted in Youth Service on November 9, 2011 by Rae. 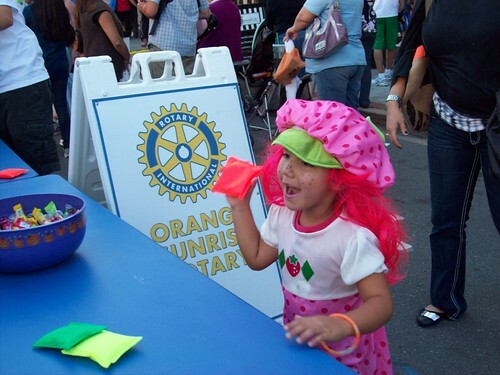 Orange Sunrise Rotary hosted a free bean bag toss game at annual of City of Orange “Treats in the Streets” event on October 27th. Hundreds of children and their parents thronged to the historic Orange Plaza for trick or treating at local stores and businesses. Many of the city’s nonprofit organizations set up game booths or sold goodies ranging from kettle corn (hiya Orange Rotary!) to tamales. The event includes a horse drawn hayride, live music, a costume contest and a Star Wars light saber battle. For more pictures, click here to visit us on Flickr! This entry was posted in Community Service, Just for Fun!, Youth Service on October 27, 2011 by Rae.